Wishing you all a Blessed Christmas! You know what? 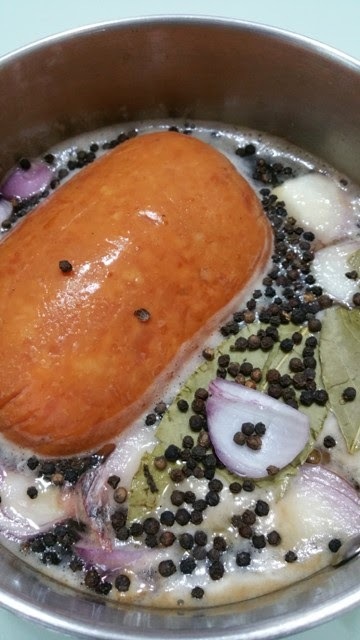 My family would never live through a Christmas without ham and this year I decided to make my own ham. I learn to make this ham from a baking session with few friends from church. We had a great fun baking ham together and we had baked about 15 hams on that day. Every one of us got to bring home a ham. My hubby and children gave a thumb up after eating the ham and that inspired me to bake my own ham for this Christmas. A baked ham isn’t ham without the glaze. Look! The ham looks so gorgeous after the glazing. One of our favourite ways to eat ham is to go with baked vegetables. 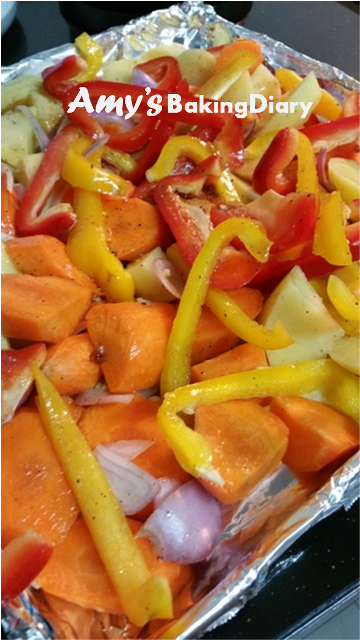 The baked veggies, especially the capsicums(bell peppers) and carrots , bring out the sweet flavour that goes beautifully with the ham. Not forgetting the mango sauce. 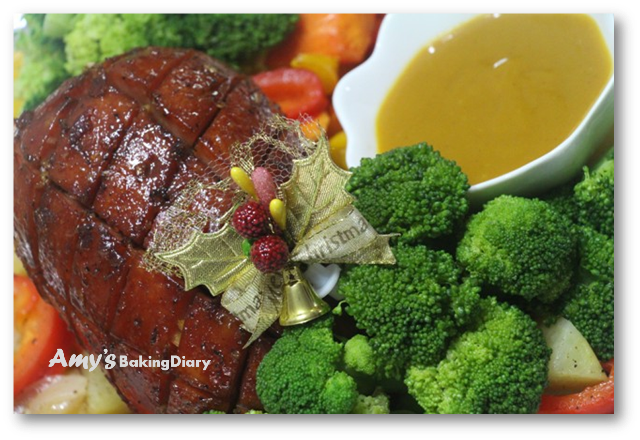 The pureed mangos and honey mustard blended with brown sugar and lemon juice make a delicious fruit-flavoured sauce to go along with the baked ham. The best ham I ever had for this Christmas! 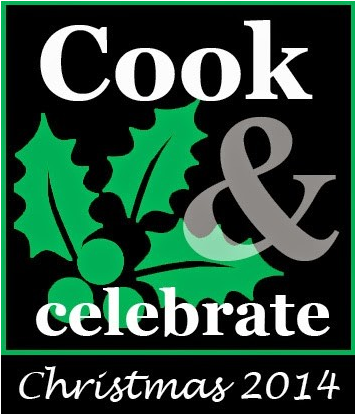 I’m contributing this recipe to Cook and Celebrate Christmas 2014 and I hope you will like the recipe. (1)Mix the ingredients together in a pot and boil it for ½ hour. Do not discard the stock. (2)When ham is cooled, score ham. Scoring the ham lets the glaze penetrate into the meat. Mix all ingredients and rub onto the cooked & scored ham and cover with foil and bake for 10 mins at 180ºC. 100g Stock from boiling the ham. 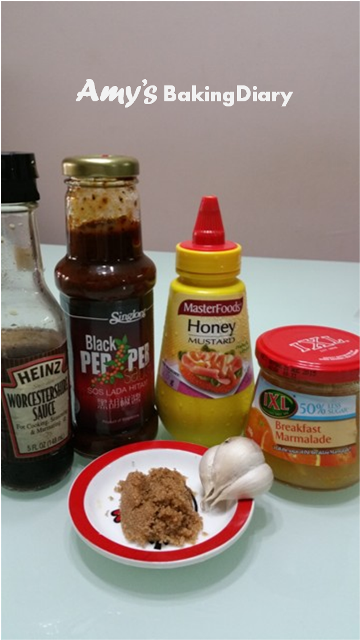 (1)Mix the ingredients. Cook the ingredient until it is thick. 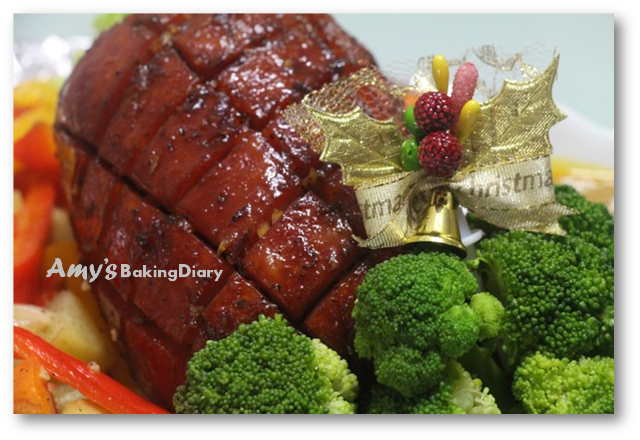 (2)Glaze the ham and put it back to oven and bake for 10mins. (3)Remove from oven and glaze the balance sauce and bake for another 5 mins. 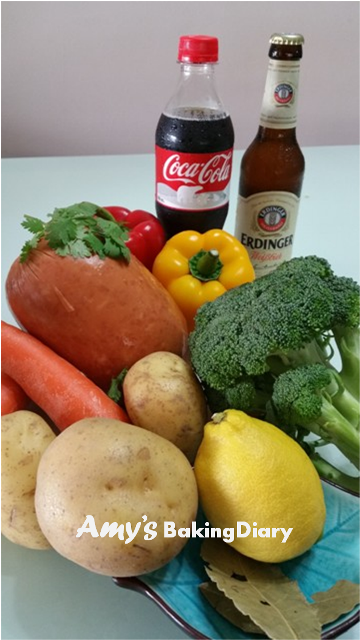 (1)Mix the ingredient (except the olive oil) and toss the vegetables together in a baking dish. Before putting it to the oven, drizzles olive oil over it. (2)Bake the vegetable until they are soft. (1)Mix the ingredient and heat it warm. 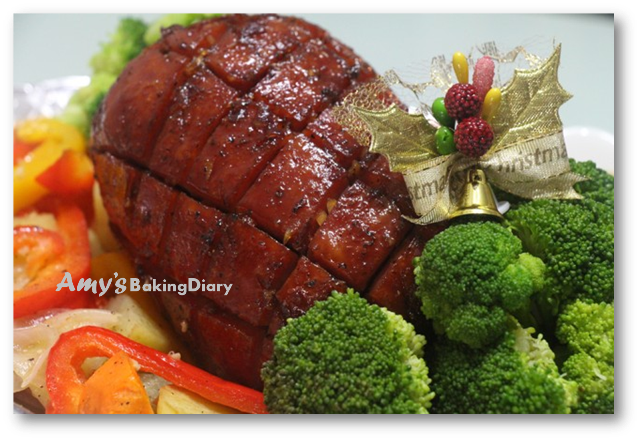 (2)Arrange the baked vegetable around the ham and served it with mango sauce. 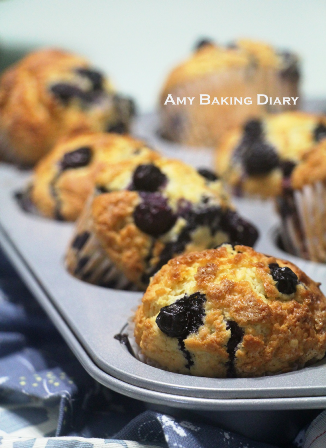 I’m submitting this post to Cook and Celebrate (Christmas 2014), organised by Yen from Eat Your Heart Out, Diana from Domestic Goddess Wannabe and Zoe from Bake For Happy Kids. Seguimos nossa caminhada na construção de um mundo mais justo, fraterno, humano, harmonioso e de doação. Todos somos promotores da Paz...que começa em nossos corações e se estende a tudo que nos rodeia!!! Obrigada por fazer parte da minha história de vida! 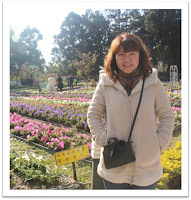 Hi Amy, blessed New Year to you & family! Looks like you had the best ham for Christmas! Cheers ! Wow, your ham is making my mouth water! It looks so, so delicious! Serving it with the veggies and mango sauce sounds really good! Happy New Year, Amy. Oh wow your homemade ham looks amazing.... I would be happy to eat this for Christmas!